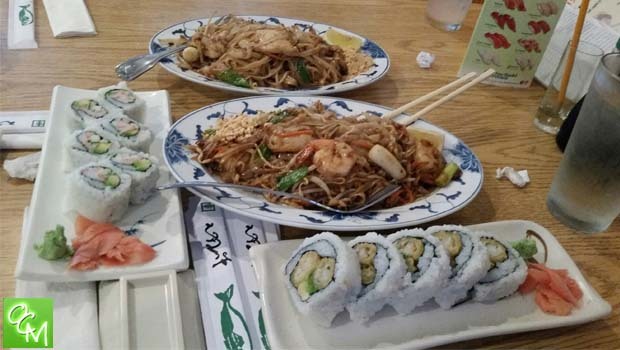 Tokyo Sushi Auburn Hills review, hours, menu info, and more. Tokyo Sushi is located at the corner of Squirrel and Walton roads in the Buddy’s plaza. Tokyo Sushi claims to have been voted the Best Authentic Sushi, plus it was located next door to my salon (Salon 35) so I conveniently met up with a friend there for lunch before our hair appointments. There are more Tokyo Sushi Oakland County locations in Commerce Twp., Ferndale, Oxford and Royal Oak. Tokyo Sushi offers plenty of seating and a sushi bar. Their menu selections include more than just Sushi. You will also find Japanese and Thai dishes including Teriyaki plates, Donburi, Udon dishes, and Fried Rice, Thai Curries, Pad Se’ew, and Pad Thai… and so much more. All entrees have lunch and dinner sizing/pricing. Everyone in our party ordered a Thai noodle dish as well as one sushi roll. There were plenty of sushi rolls to select from, but I prefer the selection offered at Makimoto (still my favorite!). I was really missing my spicy shrimp roll. I went with a scallop and asparagus roll. There were out of asparagus so I ordered it with avocado. It was a “cooked” roll, but I guess I’m just not a fan of the boiled scallop texture. My friend wanted the King Crab roll, but they were out of King Crab. We went right when they opened, but it was like it was closing time with the sold out ingredients. No biggie, just worth mentioning. My Pad Thai dish was ok, but it didn’t really compare to some of the best that I’ve tried at Sunny Thai, Sukhothai, and Bangkok Crossing. Tokyo Sushi prepares the Pad Thai with a very different sauce. It was even darker than what I’m used to. My daughter had the same thoughts about her Pad Se’ew. Tokyo Sushi offers catering…for birthdays, graduations, events, or just for fun. They offer on-site authentic Japanese Cooking in your home, backyard, or office. Tokyo Sushi also has a frequent diners punch card allowing for the 6th Sushi or entree for FREE. Year Round School in Michigan?